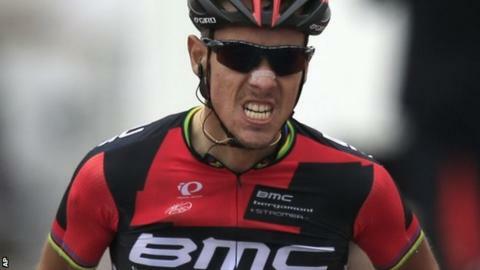 Belgium's Philippe Gilbert broke clear on the final climb of the day to claim his third Amstel Gold victory. Gilbert burst clear in the final 3km, on the ascent of the Cauberg - a 1200m climb with a maximum gradient of 12% - to beat compatriot Jelle Vanendert, with Australia's Simon Gerrans third. "I went for it at the steepest part and I'm happy I held on," he said. Briton Geraint Thomas was among several riders who crashed out but Team Sky described it as "nothing serious". "Not the way I wanted to end the first part of the season, but got taken out again," the 27-year-old Welshman said on Twitter. The first of the season's three Ardennes Classics, the 251km route from Maastricht to Valkenburg in the Netherlands featured 34 ascents to total 4,000m of climbing - the equivalent of a Tour de France mountain stage. Ireland's Dan Martin, winner of the 2013 Liege-Bastogne-Liege, and pre-race favourite Joaquim Rodriguez of Spain were also forced to abandon, along with 2010 Tour de France winner Andy Schleck. Gilbert has in recent years struggled to recreate the success he enjoyed in the 2011 season, when he earned a second successive Amstel Gold victory before winning La Fleche Wallone and the Liege-Bastogne-Liege. When asked if he would be able to repeat that trio of victories this coming week, he replied. "I've started well. It would be fantastic but for now I'm just enjoying this." The 31-year-old, who won the one-day midweek Brabantse Pijl race in Belgium, is scheduled to race in La Fleche Wallone on Wednesday and Liege-Bastogne-Liege next Sunday. 1 Philippe Gilbert (Bel/BMC Racing) 6:25:57"
2 Jelle Vanendert (Bel/Lotto-Belisol) +5"
3 Simon Gerrans (Aus/GreenEdge) +6"
4 Alejandro Valverde (Spa/Movistar) +6"
5 Michal Kwiatkowski (Pol/Omega Pharma-QuickStep) +6"
6 Simon Geschke (Ger/Giant-Shimano) +10"
7 Bauke Mollema (Ned/Belkin) +10"
8 Enrico Gasparotto (Ita/Astana) +10"
9 Daniel Moreno (Spa/Katusha) +10"
10 Yukiya Arashiro (Jpn/Europcar) +12"